This creative play set lets children build and rebuild fantastical cars, creatures, and more. When a kid really loves a toy, they'll happily play with it until it falls to pieces. But how often can they put those pieces right back together to create something new? This set of crazy construction toys will have your child's imagination spinning, hopping and flapping right out of this world. The fun starts with one of the 2 bouncy, rubbery balls, each with twelve holes that get a grip on the kit's wacky attachments: wheels, feet, loops, springy spirals, propellers and more are easily popped in and out of place. 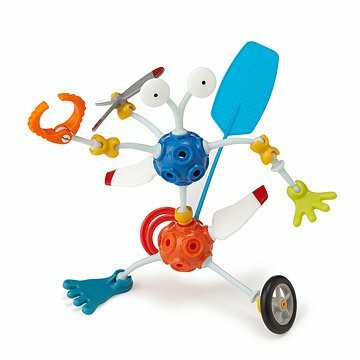 Arm-like extensions and bendable joints enable children to build creatures, vehicles, and contraptions that no one has ever seen before. It's endless, out-of-this-world fun. Made in China. This toy is a trip!! My 5yo nephew could not put it down, and neither could I. He loved making these "monsters" then role playing with them. Young folks may need some guidance as snapping certain pieces together can be tricky, but they held up very well considering the epic space battles that ensued. Great job. Great item but I would suggest some kind of instructions or at least pictures to get creativity started. Believe it or not, we both have fun being creative with this funky scullpting kit. Not for kids anymore! Unique and Fun to Give! A gift for my 5 yr. old grandson - he seemed to really enjoy it, and had fun trying all of the different parts and combinations. It was a bit difficult for him to get the pieces snapped on & off by himself, but am sure he'll get the hang of it soon enough. There are some small parts to lose or for a small infant sibling to put in mouth, so be aware of this when purchasing. A real disaster. The parts are impossible to snap together! We even got out pliers. No luck. What should have been a sweet gift for my grandson turned out to be a frustrating flop. Perfect toy to evoke creativity! My daughter loves puzzles so I was shopping around for something that allowed her to "construct" something but in her own way. She absolutely loves the Ogobild. She can put together how ever she would like. Momy likes too because it keeps her occupied, she enjoys it and its a great creative outlet (without any mess). This is a great toy that can be made into endless different toys - great for creative and fun play - we have all spent hours on it creating our own character! Bought as a gift and apparently the child loves it! I bought this toy for my son (5 1/2 year old) for Christmas 2013. He absolutely loves it and so do his friends when they come over for a play date. The toy offer endless combinations. Toy is well made with resistant and colorful rubber. Pieces are easy to snap in and out. The robots that my son create are always fun looking and joyful. I bought this toy multiple times to give as present to my son's friends, at their birthday. My daughter (5 1/2) loves to play with it as well. Received as a Christmas gift for my 3 and 6 year old boys. They play with it all the time and I find the adult family sitting down and playing with them. It is creative and fun. Easy to use for smaller children. Great toy!